Bass Traps provide even bass response, plus improved bass performance. It also diffuses mid & high frequencies, plus is a mid-bass absorber - all in one! Allow 24-48 Business Hours for Quote The advanced Corner Bass Trap simplifies the creation of natural-sounding professionally–accurate bass in acoustic spaces. The core of the Corner Bass Trap is an innovative Diffusor, an improved version of those used in classic studios since the 1930's. These have proved to minimize flat–surface reflection problems by broadly and evenly scattering sound energy. 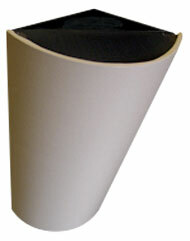 The Corner Trap's Diffusor also acts as a diaphragmatic mid–bass absorber and includes a built–in mass–loaded vinyl (MLV) membrane low–bass trap. It solves the two biggest acoustical issues — diffusing mid–to–high frequencies and controlling low bass frequencies. The Corner Bass Trap is unique, offering two complete solutions for the price of one product. The Advanced Corner Bass Trap is a Diffusor with an additional absorptive Bass Trap. Three Corner Bass Traps widths integrate perfectly with two matching models. The right combination and placement of system components will optimize your acoustic space and because of their coherent design, all system products look great together. MATERIAL: 1.5 lb. density, recycled bonded cotton fiber. PATTERN: Soft gray. Ideal behind our acoustical fabric. 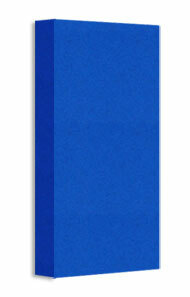 FEATURES: Exceptionally good low frequency absorption. Our kit includes enough acoustic bass trap liner material and designer cloth covering to cover 2' x 4' x 4" deep acoustic bass trap panels. Add 12' of 2" x 4" wood studs for each panel and your room will have substantially better bass - plus more even bass response in the entire room area. We offer kits for 2, 3 and 4 panels - contact us for pricing on more than 4. Simply construct 2' x 4' x 4" deep wood frames with your own simple 2" x 4" studs, add our 4" deep recycled cotton flame retardant low-frequency sound absorbing material and cover with our flame-retardant designer cloth (see swatch samples below).